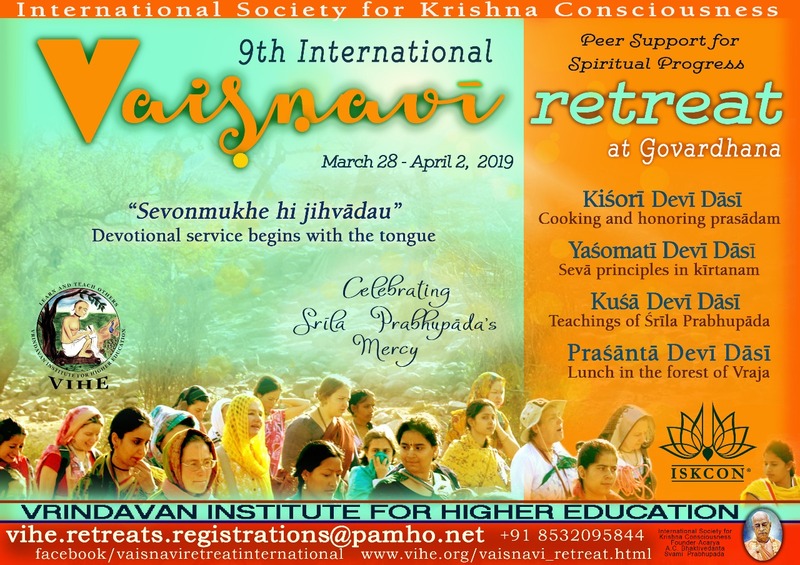 Vrindavan Institute for Higher Education (VIHE) invites all vaisnavis for its 9th Annual International Vaisnavi Retreat, from March 28 to April 2, 2019 at Govardhana. The theme for this year is “Sevonmukhe hi jihvādau” — “Cooking and honoring prasada”. We will have HG Kisori Devi Dasi teaching “The art of cooking for Lord Krishna”. HG Yasomati Devi Dasi will be teaching “The glories of surrender to the Holy Name”, HG Kusa Devi Dasi speaking of the teachings of Srila Prabhupada to his spiritual daughters, HG Madhurya Gaurangi Devi Dasi will be teaching bhoga offering and HG Prasanta Devi Dasi narrating “Lunch in the forest”. The retreat also features live cooking workshops with HG Kisori Devi Dasi. We wish to invite all interested ladies, youth forum girls and preachers to come and experience this wonderful opportunity for sadhvi sanga in the holy land of Vrindavana, under the shelter of Govardhana. You could print the retreat poster and put it up on your temple, community and nama-hatta notice boards. You may also post it on the local ISKCON internet forums, Facebook pages, websites, etc. Download International Vaisnavi Retreat 2019 poster from the top of the page. If you have any questions, would like more information, or wish to come for the retreat, please write to Madhurya Gaurangi Devi Dasi/ Balaji Priya Devi Dasi at vihe.retreats.registrations@pamho.net. You may also reach them on +918532095844 / +91 9821205738. We are looking forward to spend this wonderful week in your association. Please spread the word among your friends. Your servants at the VIHE. Click the links below for articles, pictures and videos of previous retreats.